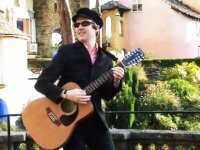 The Unmutual Website has covered several music videos filmed in Portmeirion over the years, and the latest of these is the excellent "One for the Mods" by "Village Green Machine". David Taylor of the band said "We enjoyed filming the video at Portmeirion. There aren't many places with that out of this world feel." He continued "Much of the psychedelic effects were done with mirrors, felt tip pens and an old record player! We are planning more live gigs this year, with somewhat surreal visuals, and a new album due out in the spring." The Portmeirion video can be watched HERE, and the band's official website is located HERE where their album "England's Dreaming Spires" is now on sale for only £6.95. With thanks to David Taylor and Catherine Frumerman for the info and image.